Logan, formerly Peter, aka Concrete Pete, is a five-year-old red male born May 23, 2002. Logan's sire is Gable Oscar, making his grand sire the late Gable Dodge, and his dam is AZ High Voltage. 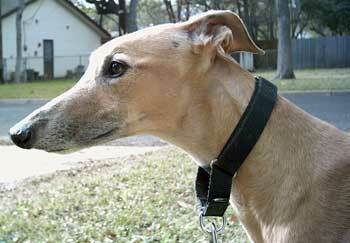 His racing career started January 25, 2004 at Gulf Greyhound Park and ended April 25 at Corpus Christi. 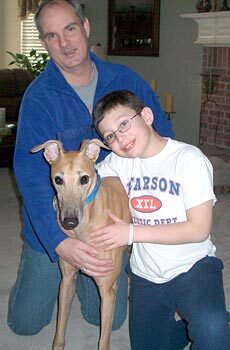 Logan was in a home for almost two and a half years, but was returned to GALT due to changes in the family. 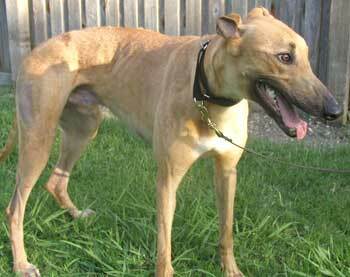 Logan gets along well with other dogs, and he is small animal and cat tolerant. Logan, a sweet 5½-year-old fawn male, was previously in a home (until a baby came along) and as a foster dog is a perfect house guest. If you are reluctant to adopt a male dog because you are afraid of marking, this boy will change your mind. He has wonderful manners. He loves to go for walks and walks well on a leash with no pulling. He settles down easily in the car and loves to travel. 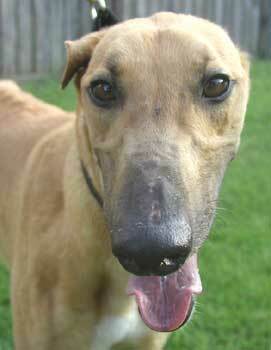 He is a gentle boy that is fostered in a household with two other greys, an Airedale, and an 86-year-old man. Logan gently maneuvers around everyone and everything. He is curious about squirrels and cats but doesn't seem to chase them. He must have learned to jump somewhere, because he sometimes gets on my high four-poster bed when I'm not looking. Logan seems to be skittish around children, so I would not recommend that he be adopted into a family with small children. But he loves to have company (more people to pet him) – there seem to be people coming and going all the time. He is a beautiful, lovely boy who needs a caring home and wants a cuddle buddy. One of his favorite pastimes is to lay on the couch with his head on your lap.